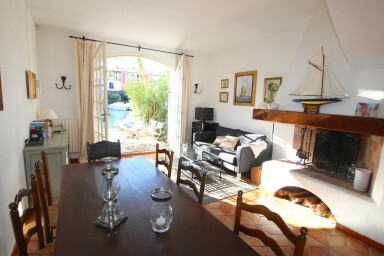 Beautiful fisherman house located in a quiet area of Port Grimaud South. On the ground floor, a well-furnished kitchen and a living-room. On the first floor, one bedroom with two single beds, one bedroom with a large bed, a shower-room and separate toilets. On the second floor, two bedrooms with a large bed and a bathroom. AIR-COINDITIONING in the two West-oriented bedrooms. On the canal side, a West-oriented terrace to enjoy the sun until the evening. A 10m x 4,26 in front of the house.